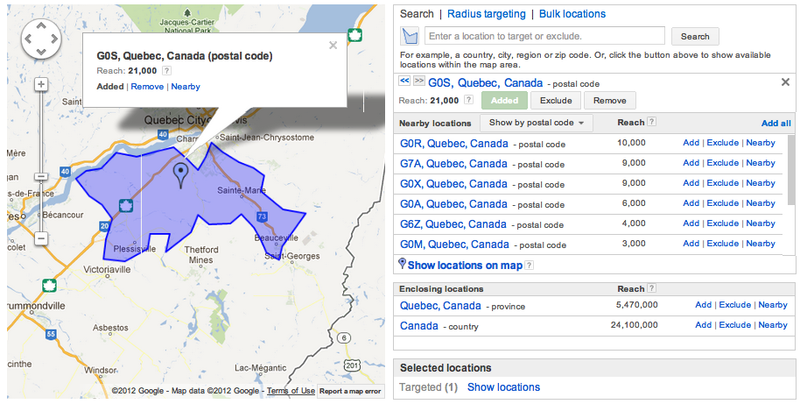 Expanding on our launch of ZIP Code targeting in the US, Canadian Postal Code FSAs are now available for targeting. You can now reach over 1,500 Canadian Postal Code FSAs, the first three digits of the Canadian Postal Code. 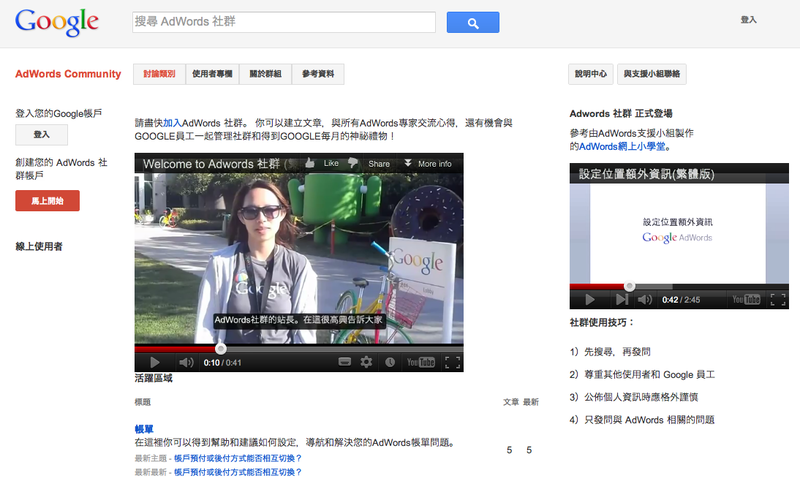 Now you’ll be able to plan, buy and get reporting with AdWords the same way you do with direct mail. Plus, with the “Bulk locations” tab in the AdWords location targeting tool, you’ll be able to easily enter up to 1,000 locations per country at a time. We've recently changed our U.S. metro targeting areas to Nielsen® DMA® (Designated Market Areas) regions. Now your online campaigns and reporting will more precisely match TV-based audience data and campaigns. If you’ve been using metros, you’ll notice that the new geographic shapes look different on a map. While you might see some increases or decreases in traffic with the new regions, we estimate the impact will be small for most advertisers. 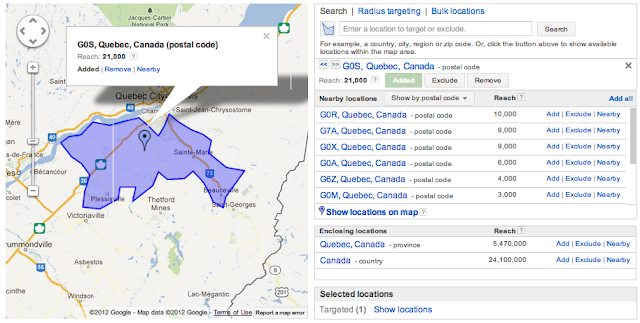 As always, if your business has a fixed service radius and you want to more tightly target a campaign to that area, we recommend using the radius targeting option to identify and select specific cities and postal codes to reach. That brings our full list of countries with city level targeting up to 43. Also new to Belgium, Denmark, Ireland, India, Sweden, and Taiwan are location extensions. Location extensions show your closest business address and phone number along with your search ad, making it easier for customers to visit or call. So let’s say you are a manufacturer in India and sell through retailers in many cities across the country. You can now analyze your performance by city using the AdWords geographic report. You might see that you're getting a better conversion rate and larger order sizes in big cities like Delhi and Mumbai. So you create a supplemental campaign just targeting Delhi and Mumbai with higher bids and distinct budgets. 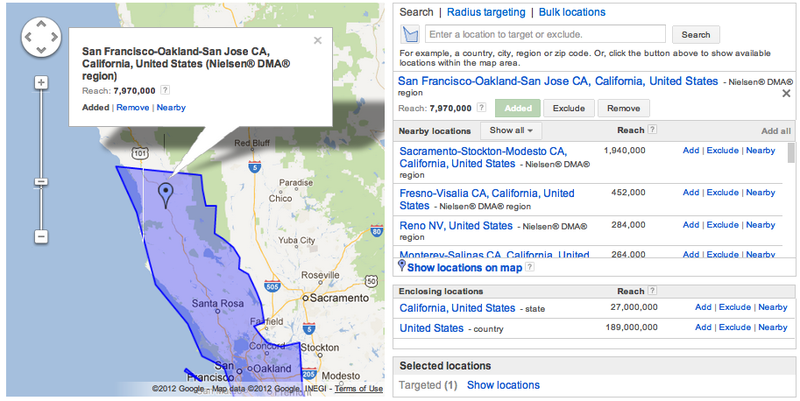 Next, you set up location extensions to show your local sales office locations in each city. And you use location insertion to add “Mumbai” or “Delhi” to the end of your visible URL whenever your ads show in that city to help make your business feel even more local. You’re now set up to get more clicks, conversions, visits and phone calls to help your business grow where it matters most. Location matters. Whether you’re running a national bank in Montréal, Canada or a contemporary fashion boutique in Brugge, Belgium, being able to target or exclude certain geographic locations with your online advertising can boost your business and save you money. Today, advertisers in Canada, the US and 9 other countries have even better local targeting options with AdWords. for a look at ways your business can kick start its presence on Google+ in a Learn with Google Hangout on August 23rd at 1pm EDT/10am PDT. RSVP for the Hangout on our Google+ Event page. is an important part of successfully managing your account and delivering ads that are safe and useful to users. To help you understand how policies affect the delivery of your ads, we recently introduced a status insights icon on the Ads tab. We’re now following up with another feature to help you identify policy issues more quickly: a new Policy Details column. This information is available for paused ads as well, which can be particularly helpful if you want to know the status of your paused ads or if you need to temporarily pause a campaign while you work out some policy problems. (GOMC) which is now in its fifth and most competitive year yet. A total of 11,000 students from 86 countries/territories participated in this year’s challenge and the results are in. What happens when you give hundreds of student teams across the world an AdWords online advertising budget of US$250 and three weeks to help a local business improve their marketing campaign? A great lesson for advertisers of all kinds. In an effort to help build the next generation of innovative digital marketers, Google has been annually hosting the annual Google Online Marketing Challenge (GOMC) which is now in its fifth and most competitive year yet. A total of 11,000 students from 86 countries/territories participated in this year’s challenge and the results are in. designed to help guide small and medium sized businesses through the transition to Google Shopping. We appreciate how many of you took the time to join the Hangouts and wanted to make the sessions available for those who were not able to attend live. In his autobiography, Former House Speaker Tip O’Neill famously said “All politics is local”. With all 435 seats up for election in brand new Congressional Districts this November, that adage rings even more true for House candidates running this fall. Through the redistricting process that takes place every 10 years, every district takes on a new shape - with new voters. This makes reaching the right voters with the right message even tougher. Starting today, in addition to targeting specific zip codes, we’re enabling an even more useful solution that allows political campaigns to reach voters within a specific Congressional District. Say you are running for Congress in the 6th District of Maryland - which features a highly publicized race between Ten-term incumbent Rep. Roscoe Bartlett and Montgomery County businessman John Delaney. The 6th is located in western Maryland, and has been a longtime GOP stronghold, but was drastically reshaped by redistricting which has made it more competitive. As campaigns know, reaching these households in an effective manner with traditional means takes time and - importantly - valuable resources. This district is a great example - it includes voters who live in the Washington D.C. media market. But, as you can see from the map, buying TV ads in DC won’t reach your voters in the 6th District. Now, with congressional district targeting in AdWords, campaigns can quickly and easily target their search, display, mobile and video ads *solely* within that particular district’s border. You can start by heading into AdWords and selecting your District number from the location menu populated with district information in simple Google Maps format, prepared by Azavea. Build your ad and you’re on your way. We’ve built a sizable team that is working around the clock to help all candidates get the most from their online advertising efforts. Congressional District Targeting in AdWords is just one more way that we’re working hard to deliver better ads for users and voters and better tools for political campaigns. By working across all four screens, digital ads are highly accountable, precise, and continually evolving. Google’s complete solution helps thousands of political campaigns in all shapes and sizes make the web work for them. Our products are designed to work together, enabling campaigns do more with less online. Head over to the Four Screens to Victory site to learn more about how your campaign can win the moments that matter.